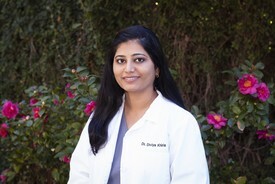 Dr. Diviya Khiria is the proud owner of Arden Oaks Dental Care. She graduated from the prestigious University of Pacific Arthur A Dugoni School of Dentistry and has been practicing dentistry for more than 10 years. Dr. Khiria is passionate about dentistry and keeps herself up-to-date with all the new advancements in Dentistry. She has completed extensive continuing education hours, specifically related to popular services she and her team offer their patients, including implants and esthetic dentistry. Through her extensive experience she has learned how to balance technical skills with an artistic sensibility for aesthetics. She is soft spoken and has an in-depth knowledge of both preventive and restorative care and shares it with her patients in a way that is easy to understand. Her caring nature along with a gentle hand has won hearts of her patients. To providing the best dental treatment to our patients. To helping our patients to have a pleasant dental visit experience. To providing comprehensive dental treatment with our in-house Orthodontist, Oral Surgeon, Endodontist and Periodontist specialists. To providing our patients with a beautiful smile. To helping our patients save money and create value for the treatments they receive. To using state-of-the-art technology for dental treatments. We are equipped with CEREC for same day crowns and CBCT for 3D imaging. From Dr. Khiria: "As a wife and mother of two daughters, I am keenly aware of the importance of good general health for all family members. I live in the Sacramento suburbs. In my spare time I love to cook, I enjoy reading biographies and watching movies."